I didn’t exactly grow up in an “organic” household. In fact, my dad has worked in the farm chemical industry for years, both selling and applying herbicides and pesticides. I grew up surrounded by every form of herbicide and insecticide you could imagine. 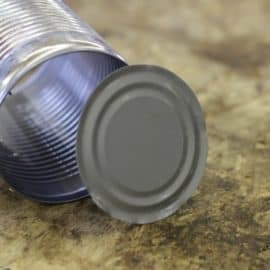 All of our childhood coffee cups and kitchen utensils were emblazoned with the names of various chemicals and seed treatments. 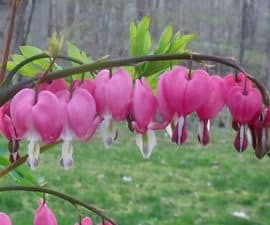 I remember the seeds we planted in our garden each year were bright pink from the “pre-treatment” applied to them. My DIY Liquid Fence recipe is a good option for keeping out bunnies, but I still needed an organic pest control method to keep insects from mowing down my beans and beets. I blame it on the extremely abnormal amounts of moisture dry ol’ Wyoming has had this year, but it’s been a constant battle to keep my poor little plants from being devoured. The Prairie Kids pickin’ bugs. 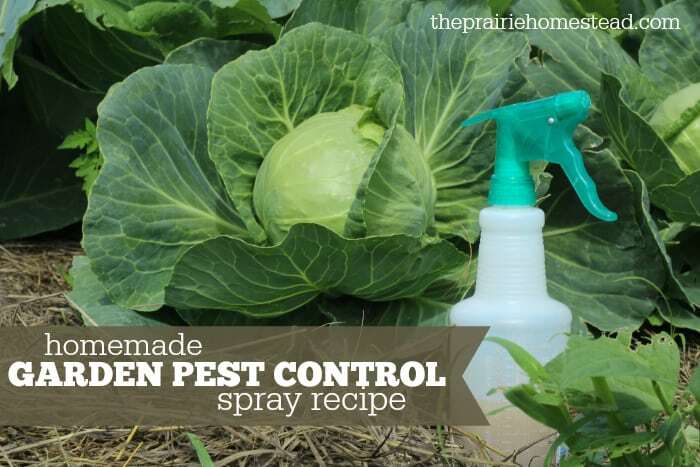 Which is why I turned to this homemade organic pest control garden spray. So far, it’s seemed to help the plants I’ve sprayed it on, the key is just being diligent with your spraying efforts. 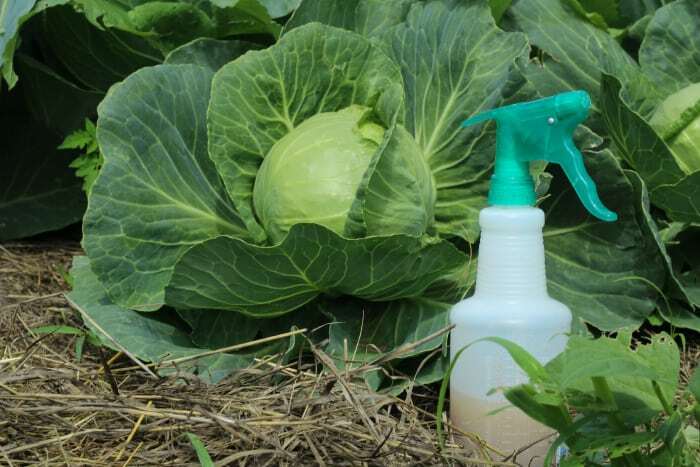 Why use these ingredients for Organic Pest Control? Onions & Garlic: It’s a fact that most pests (including rabbits) don’t love the strong flavors of onion and garlic. Interestingly enough, the green bean rows next to my onion rows are mostly unaffected by nibbling insects, while the rows further away look like green bean lace. Mint: Critters and creepy-crawlies tend to steer clear of mint as well. I love adding peppermint essential oil to my homemade bug sprays, and fresh mint leaves work the same way. I used the basic peppermint growing in my herb garden, but you could really use any variety of mint you have hanging around. Cayenne: Spicy stuff isn’t the way to win your way to a hungry bug’s heart. But that’s what we want. 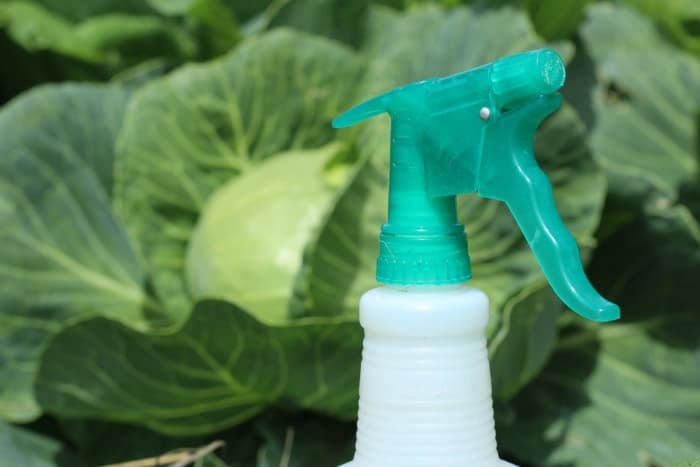 Soap: Adding a bit of liquid soap (like this) to your organic pest control spray helps it cling to the plant’s leaves. Place the onion, garlic, peppermint, and cayenne in a blender, and pulverize it. 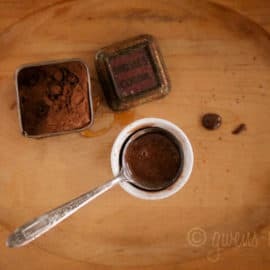 Allow the mixture to soak/steep for a couple hours (optional, but do it if you can), then strain with a fine mesh strainer. Add the onion/garlic mixture to a one-gallon contain (an old milk jug or vinegar jug will work), add the soap, and enough water to make one gallon. Pour into a spray bottle and spritz on any plants being attacked by bugs. Spray 1-2 times per week, or after a heavy rain. Make sure you use a super-fine mesh strainer, (or maybe even cheesecloth?) to strain this stuff. Otherwise, it’ll clog your sprayer, which is annoying. I generally try to spray in the evening when the sun isn’t as hot, otherwise, there’s a risk of the spray and sun combination burning the leaves of your plants a bit. I don’t spray this over my entire garden, just on the plants being eaten the most. I use this liquid castile soap or this natural liquid dish soap, just in case you were wondering (both are affiliate links). Goodness, is that your cabbage in the picture?? Cause that is the most beautiful cabbage I’ve seen. Uhm mine are rather lacey. 🙁 I may give your spray a try. Yes– for some reason, my cabbages are doing beautifully this year! Mine were really lacey last year. 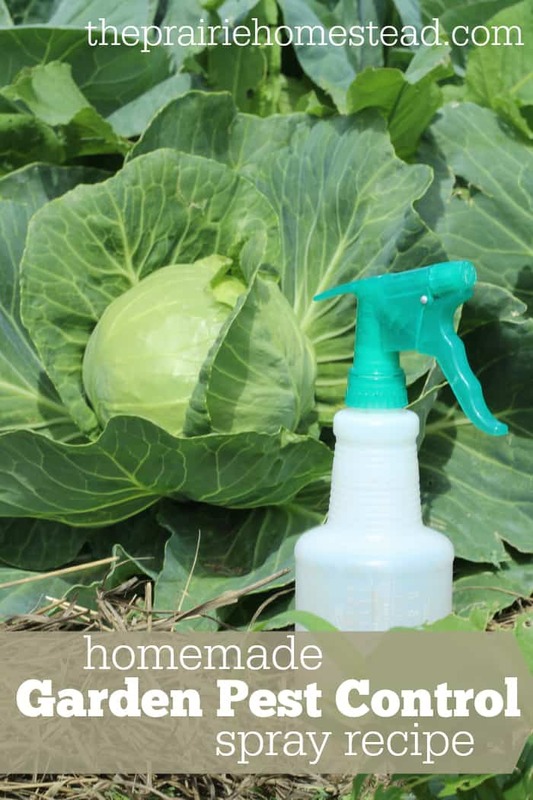 I can’t tell if my homemade pest sprays can take full credit for the better outcome OR if I just have fewer cabbage-loving bugs this year. Mine too, cabbage and cauliflower are ENORMOUS! Self rising flour dusted on the beans will kill the bugs from the inside out from the yeast. And not be harmful to you… just a trick I learned yesterday. ? That is interesting! I have a boyfriend obsessed with dusting plants for Japanese beetles. I would rather give him something less harmful to dust with. However, we have a honeybee hive. How should we go about applying the flour where it will do its job and not harm the honeybees and their babies? Anybody else done this or have any suggestions? Thanks so much! I understand why you love homesteading. I know where everything I ate two days ago for Sunday came from. The beef was raised by my uncle and packaged by my neighbor. The green beans, potatoes, and corn came from my backyard garden. It was the BEST TASTING meal I’ve ever had! My husband, adult kids, and grandsons agree. The three-year-old couldn’t get enough corn on the cob. His face was covered with butter, from dimple to dimple. I also relate to the excitement you feel when you get the first egg from your chickens. I’m waiting for the first ones from my Welsummers and Buff Orpingtons. It should be any day now, and I can’t wait! I’m in the thick of canning and freezing vegetables and fruit. My kitchen counters are filled with green beans, corn, dill pickles, bread and butter pickles, peaches, and nectarines. I won’t be canning my own applesauce or apple pie filling this year. I only have 7 little apples waiting to ripen. We had a storm with strong winds, and I lost all of the blossoms from my tree. So, no apples this year. I’ll have to make a trip to the orchard for their apples. I’m just beginning with my lifelong goal of raising bees, and I love it! There are times that I just open the hive boxes and watch the bees. I haven’t been able to harvest any honey yet, but I did sneak a little yesterday, when I was doing some work on the hives. It was delicious! My husband agreed. I don’t have goats, but I’m looking. My youngest son’s girlfriend is a goat expert, and a former 4-H grand champion goat project winner, many times over. She’s helping me, and I’m hoping to add a few dairy goats soon. Will I ever be finished with projects? Will I ever be done buying Mason jars? Will I ever buy an egg or a jar of applesauce from the store? I hope not. 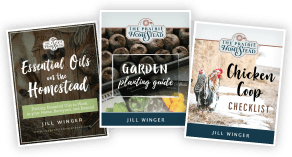 Thanks for encouraging us with our homesteading skills. We’re kindred spirits for sure, Chris! Love it! I am about to start my fall garden, and have been discouraged by everyone warming me of all the different bugs who will want my yummies! I plan on planting onions in each raised bed along with marigolds but I will mix this spray as backup as well! Yes– next year I’m totally going to intersperse my onions rows through out my garden more! Also, I read the suggested book, “Folks, This Ain’t Normal” and am so fired up. I discovered yesterday a lady just a few hundred feet from my house raises chickens and sells eggs, so we are on our way to local and homegrown. Thanks for your blog it is extremely helpful. Way to take action, Rachel! And yes, isn’t that book incredible?! Would green onions suffice? My space is very limited, so am growing in groups of stuff. Green onions take up a tiny footprint, and could be placed in a bit of dead space between other plants. Would love to hear your thoughts! Question: where do you apply the spray if not on the parts of the plant you want to eat? Be careful with what you spray on your leaves, my artichokes weren’t too happy. The bugs were less thrilled, just be careful. 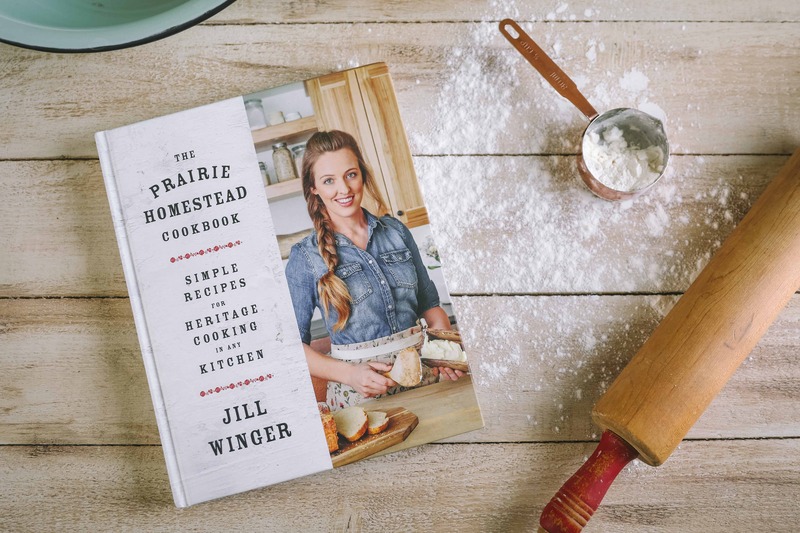 Thanks for all the great tips Jill, you are an inspiration! The bugs….especially the grasshoppers, spiders and earwigs…..have been really bad this year…..I live just a few hours south of you Jill……our weather is anything but normal…..in fact we had over an inch of rain in 35 minutes this afternoon. My green beans, basil, thyme, and Brussels sprouts have been getting hit intermittently since April. I have tried just about everything…… French dwarf marigolds, peppermint, onions, garlic, store bought organic insecticidal soap, neem oil, DE, etc…….still getting hit…….I may need to give your spray a try, though I will need to be extremely careful with making and handling it……I am allergic to capsaicin (the active ingredient in hot peppers)…..but if it saves my crops its worth the risk and the extra rinse before eating. try baking soda in your post-harvest rinse just to be safe. 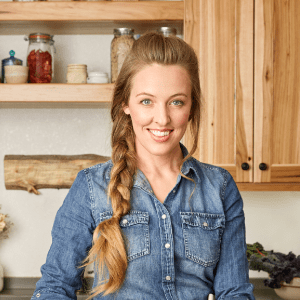 This is a great list of ingredients to fight bugs – I’ve been blessed this year because the chickens, quail and emus are doing a fantastic job depleting the bugs on our little farm and garden. So blessed. 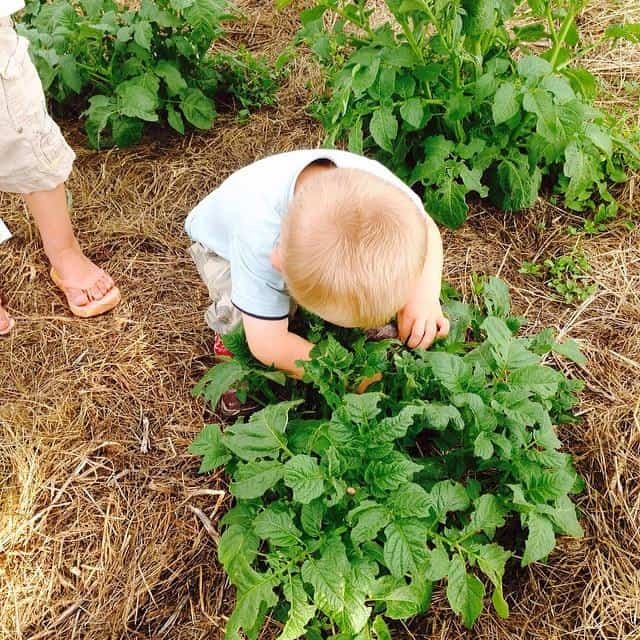 Planting peppermint in the garden is also a great detour for bugs. Yes– chickens do a great job, don’t they? I didn’t know emus helped too– how neat! Just one problem, Jill. With all the bug and pest repellents, how do the squash, beans, peas, cucumbers, etc., get pollinated when they flower? I’m not about to attempt hand-pollination at this stage of life! Also, I hope this stuff is OK around honeybees—just sayin’. Your natural bug spray sounds great! I have one question about it tho. After u pulverize the ingredients, do u then soak them in water? And after straining them, do u then use the water in which the ingredients have been soaking in it and discard the pulverized materials? I was wondering if this will work on aphids? I have used pepper & soap mixed in water on my vegetables for years. Food for thought & more ; I plant chili, cayenne, bell, banana and habanero peppers in my garden. I dry and preserve to eat all but habaneros. They are way too hot, however; these peppers are prolific. Two plants allow me to mix up my spray for this year and have many to dry for the next season. I do have to wear a bandana over my mouth to avoid searing my lungs. I hope this is useful while thanking you for the tip on using mint. I have mint everywhere! Happy gardening! Fantastic tips Teresa– thank you! I’ve got to plug Howard Garrett at dirtdoctor.com. He’s got some recipes from “stuff around the house” for organic pest control. In his bug spray which is similar to yours he adds a couple of peppers (jalapenos, etc) to the blender with the garlic. Hello! Thank you for sharing your natural bug repellent! I live on the KY/TN state line and I have SO many issues with bugs, seems to be of all kinds. I am currently brewing to use on my plants, but have a kinda specific question. I am a beginner (3rd yr) gardener and absolutely LOVE summer squash! My first year growing it I had an amazing season. Last yr the squash bugs took over, so I had almost zero yield and they killed my plants completely. This year I’ve been watching early, removed them and eggs by hand, planted yellow marigolds and dwarf sunflowers in an attempt to keep the bugs off my squash. The dang things keep coming back! Do you think your spray will work for squash bugs? Also, do you have any other pointers you could give me on keeping these nasty bugs out of my garden?! Please help! I’ve only had 1 good zucchini so far this year, but I guess the positive is my plants still appear somewhat healthy. My squash bugs (and other bugs and worms) have been worse than EVER this year. I’ve been using two tablespoons of soap and a gallon of water, sprayed directly on the bugs…and it kills them on contact. And I am talking 100’s of those bugs! So I know Jill’s recipe will work, as it has the soap in it. I’m definitely making me a brew and using it tonight! Thanks so much! I am in Northern Nevada and have had an unusually wet spring this year! Am going to try your recipe, nothing else has worked so far. I have seen more grass hoppers this year than ever! As for the squash bugs….been doing battle with them for the last few years (since they found my garden). No children left in the household, so its just me to hand pick the little things (boy do they stink!) I have even found the eggs on the marigolds I have planted all around the squash (great deterrent they turned out to be). 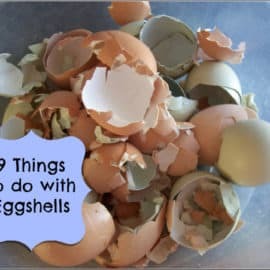 I keep a large opening plastic jar half filled with soapy water close by to drop them into (eggs too). Then I let it sit in the sun with the lid on to kill them and the eggs. Been doing this garden organically (Hubby says wouldn’t it be easier to just use a garden spray) would rather not, I like knowing what is in my veggies. Have seen lots of lady bugs, bees and this year lacewings, so the beneficial insects are here too. Hope it works for you Anita! I would love to have a organic way of keeping fungus from infecting my Kale – there is a white powder forming on the leaves and it is very bad at the moment. I just wash it off when i pick the leaves, but I would rather have dark green leaves than white powder covered ones – do you have any solution for me? Thank you so much! Wonderful information!!!! Is there anything I can use instead of Cayenne pepper? Or could I use none at all? You can just omit if you wish. Will this take care of black flies? The best thing I’ve fouND for flies are traps. There’s a brand you can buy called Trap n Toss (got mine at Tractor Supply, but I’ve seen them on Amazon). They come with an attractant that doesn’t smell the greatest, so hang it away from where you want to hang out. But it’s pretty amazing how quickly they start piling up in there. You’re supposed to just toss it when it’s full. But that is such a waste. The big ones that I get, I just shake them out and re-bait them. You can buy a bag of the attractant by itself. It’s a gross, messy job. But it works. This mom of 14 has been gardening for a little while and have learned there’s always something more to learn.so just thought I’d share…an Amish man told if you have potatoes bugs your soils not sweet enough, pour a stream of black strap molasses in your trench before planting potatoes.. I put 1-1 1/2c. Of black strap molasses to a one gallon pump up sprayer. (couldn’t pour it in the trench at the time) Just spraying has worked wonders. Very minimal potato bugs, the grasshoppers leave my green beans alone, flea bettles now hate my beets. All looks beautiful, I’ve sprayed it on everything!! Amazing!!! Must reapply after a good rain. Hope it helps! Did you spray the molasses solution on or around your beets after they came up? (just clarifying to understand). The flea beetles love the green leafy crops also. Will this work for fruit trees? Thanks for the information. What do you think about using neem oil to keep the bugs away from the veggie plants? Both my husband and I work full time, have three incredibly involved and busy children and we are keeping up with a large garden and two bee hives, ao I truly need the fastest way too deal with my stained glass looking broccoli, cauliflower and brusselsprout plant leaves. The rest of the garden is looking decent so far (fingers crossed) once I replanted most seeds twice this year!! Ugh. Tough start in the NE with a cold and extra rainy spring. I have been very successful with good old neem oil to keep aphids, white fly away from my tomatoes and other bugs from the rest of my garden however, I am having a HARD time with harlequin bugs on my Brussels sprouts. Neem kills them but only if I collect them in a cup and douse them. I will have to give this spray a try. Oh and by the way, if you have lace leaves the culprit probably is the Japanese beetle if found in your area. They are notorious. And work at night….by morning they are gone! They started chewing up my berries and a little neem oil and a netting for a few nights did the trick. Gone! I knew it was the Japanese beetles because they devoured my grapevine but I never saw the culprit so after doing research I learned it was them that made my grapevine into lace!!!! ?. Thank you! Jill, do you know how this would help kill box elder bugs? Or could you recommend another recipe? Each summer we are assaulted by them. I usually spray them with soapy water but it’s just never enough or it ends up practically being a full time job, so my hubby breaks down and hires a guy to spray them. TIA. Oh, my peonies leaves sadly get black patches on them. Wondering if it’s a fungus and what you’d suggest for eliminating them. Could they become “healed” or must I just remove them? I have a peppermint castile soap with hemp oil. Can I use that? Is this mix bee friendly? Is this mix bee friendly or not???? What about our honey making friends? Safe? Do you grow comfrey? I make a tea from the leaves and spray that on my plants. Bugs don’t like it! Also, the leaves make a great soil amendment to your garden. How long can this be stored for? Should it be refrigerated? If you garden with chickens or your pets are in the garden with you after spraying, I would omit the cayenne. If the cayenne gets on their skin or in their eyes, it could be very painful. You mentioned that your green beans that are nexy your onions are not bothered by bugs. Have you considered planting onions between several rows of green beans so that the entire area of green beans are protected from bugs? I do this & sell the extra onions as we are not huge eaters of onions. Does this solution work for the deer too? Deer have been turning my flower beds and vegetables gardens into their own personal salad bar this summer! We tried a smelly (like moth ball) rabbit/deer repellent, but it hasn’t completely kept the deer away. In one night, they ate 6 bell pepper plants, and every time I get a new bloom on my one cute little potted gerbera daisy, it disappears by the next day! They also eat ALL of the greenery off my mini petunias. Most irritating thing ever!